Hi, my fuscias keep dying. It is 30 degrees Celsius and dry. I live in Rhodes, Greece. I water it every three days and feed it with a phosphate which was recommended to me by our local garden center. The leaves turn a grey/ green colour and fall off. It’s in partial shade. This is only happening to my fuscia. What am I doing wrong? Can you offer me any advice. Thank you. 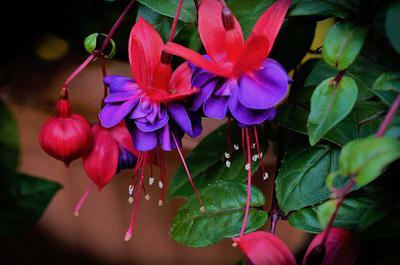 You've already pegged it - these plants originate in places like South America and Haiti. The climate there is quite humid, not like Greece where the air is dry. These plants need much more moist air than where you are. I suggest spraying the area around the plant with a very fine spray, and leave some trays of pebbles nearby with water that can evaporate over a longer time. Partial shade is good, but if it's that hot make sure that they're shaded in the afternoon when the sun really beats down. Don't forget the effects of reflected light too - there are lots of places that seem shaded, but light reflects off buildings or other structures. I would water it a little more often and don't fertilize it until you've got this problem licked. Too much fertilizer at the wrong time can burn the roots, making the problem worse. Phosphorus is used to promote flowering, but if the plant is trying to die, this won't help. Carol, pictures are a good idea - you can create a new post and put them there, then I'll merge your questions.